Image: The PM and Chancellor at the Royal Free Hospital in June, where May pledged £20bn extra to the NHS. Credit: Stefan Rousseau/PA Images, all rights reserved. At the Conservative party conference in Birmingham last week Theresa May danced onto the stage and declared that austerity was over. This was just the latest sign of a growing agreement in British politics that public services are under strain and need an injection of cash. An area of particular cross-party consensus is that the NHS should have more money. A vast majority of the public agree, and the government has promised an extra £20 billion a year by 2023. 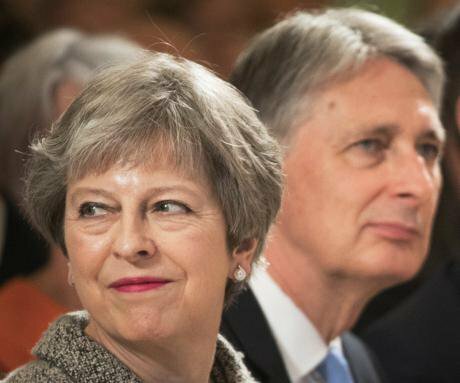 Both the Prime Minister and the Chancellor have said that at least some of this will come from “fair and balanced” tax rises, to be announced at the Budget at the end of this month. The question now is which taxes might rise, and by how much. At Tax Justice UK we believe that if the government is going to increase taxes, those with the broadest shoulders should pay the most. Our new report, “The World We Want: The role of taxes in funding the NHS and other public services”, sets out one way the government could find the promised £20 billion. We followed four guiding principles for any tax changes: companies and the wealthiest should pay their fair share to ensure trust in the system; tax should increase in proportion to a person’s wealth and income; a sustainable tax system needs to look beyond increasing taxes on just those at the top and companies; and the poorest should be protected from tax rises. Taxing wealth better is at the heart of our proposal. In the UK, wealth is spread deeply unevenly, with knock on effects on people’s life chances. Those with the least suffer the most, with insecure work and skyrocketing housing costs. This is made worse by a growing generational gap: young adults today are unlikely to be as well off as their parents. Importantly, there is political support for raising taxes on wealth across the political spectrum, including from Peter Oborne, Lord Willetts, Rachel Reeves and Vince Cable. And doing so would pay multiple dividends: not just helping to find the extra money the NHS needs, but redressing imbalances in our society that were part of the reason people voted for Brexit and that continue to foment unrest. A first step would be to cancel the plans to cut corporation tax from the current rate of 19% to 17%, which even many business groups don’t support. Corporation tax is an indirect way of taxing wealth, as share ownership and pension holdings are concentrated amongst the rich. A rate of at least 20% would bring in an extra £8.4bn a year, and would have a much less dramatic impact on inward investment than some claim. The government should also fix council tax, which is a mess. Wealth in Britain is primarily made up of pensions and property, both of which attract significant tax breaks. Due to huge changes in property prices over the last three decades, the amount people pay is only weakly connected to the value of their property. A proposal from the Resolution Foundation, which would replace the current system with a tax levied in proportion to a property’s value, would leave nearly three-quarters of people better off while raising an extra £5 billion. This money should stay with local authorities to help plug the holes in their budgets, including for adult social care. Other recommendations in our report include: abolishing entrepreneurs’ relief, which would raise £2.7bn; taxing income from wealth at the same level as income from work, which could raise £4bn; applying National Insurance to earnings of those older than the state pension age, which would raise £1.3bn; and curbing the pension subsidy to the wealthy, which would raise £2bn. In total, we’ve identified a possible £23.4bn in savings from these progressive tax reforms, and believe more could be unlocked if the same guiding principles were followed. For too long in the UK we have been living in a fantasy world whereby we can have low taxes – our corporation tax rate is the lowest in the G7 – and very high-quality public services. Mrs May’s conference speech was tantamount to an agreement that this position is neither sustainable nor in the country’s best interests. The promised increase in funding for the NHS should be a starting point for a broader debate about the level of public services we want and how to pay for them. Tax Justice UK’s vision is of a society where people do not have to wait months for desperately needed operations, schools have enough resources to teach children properly, people have access to affordable housing, and elderly and vulnerable citizens are properly cared for. Achieving this will mean taxing many of us more, and taxing the wealthiest the most. It will mean taking on powerful vested interests and rebuilding a sense of unity and solidarity in an increasingly divided country. And it needs to start now.